A thread looking at some of the 2 MHz beacons in Western USA. If you find these reports useful, please feel free to reply with comments or feedback. 2008.41 kHz CW, UNID, ditter, beacon, land, weak readable, -120 dBm. Note: This beacon's timing is somewhat variable, possibly due to voltage or temperature. Dit duration: approximately 170 to 200 milliseconds. Dit repetition rate: approximately 1.5 to 2.7 seconds. ON cycle: 90 to 100 seconds. OFF cycle: 3.0 to 3.3 minutes. 2097.30 kHz CW, "A", Morse, beacon, 9.9 second repetition, good readable, -107 dBm. PLAY AUDIO recording of 2008.4 kHz CW UNID ditter beacon 2018DEC27 0327UTC recorded in USB mode at 2008.0 kHz with 300 Hz bandwidth passband filter. PLAY AUDIO recording of 2097.3kHz CW A Morse beacon 2018DEC27 0358UTC good and clear with a little background lightning static. Image below shows the nearby Pt. Arguello Digisonde ionogram at the time of this recorded log, with good 2 MHz NVIS propagation, foF2 = 2.375 MHz and fxI = 3.0 MHz. Highlight of this report: land beacons mixed with fishing buoy beacons on 2 MHz. Here on the California coast, there are a lot of Pacific fishing vessels within range, and their drift net buoy beacons can be heard. It is often difficult to tell at first if a mystery signal is out in the ocean or on land. This makes HF and MF beacon hunting even more fascinating in some areas of the spectrum. 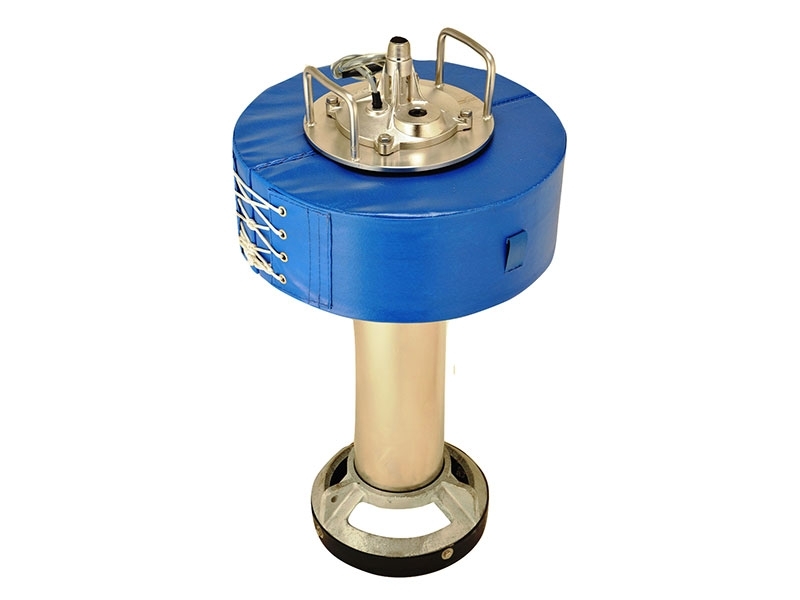 There are some types of beacons which are easy to spot by their characteristics. There are older dasher fishing buoy beacons and then there are CW Morse ID fishing buoy beacons, both of which require vessels to Direction Find (DF) them, and they both seem to be a lot more rare lately. That is probably because the more modern GPS fishing buoy beacons now use either digital HF/MF modem bursts or Selcall response, or else they use all-satellite fishing buoys (such as L-band IsatData 1525.0 to 1559.0 MHz/1626.5 to 1660.5 MHz), which provide the vessels with exact coordinates and tracking (without the need for DF). This 2 MHz report includes some of the older CW buoy beacons, mixed with at least one land beacon, and one unknown whether it is land or sea. If you found this detailed report useful or interesting, please take a moment to reply with a comment on it. 2006.00 kHz CW, "LC6", Morse, fishing buoy beacon, 3 minute OFF cycle, fading, readable, -120 to -130 dBm. Note on LC6 timing cycle: 3 Morse IDs repeated with a long DF dash, then beacon is OFF for approximately 3 minutes. 2008.40 kHz CW, UNID, ditter, beacon, land, good readable, -110 dBm. 2065.01 kHz CW, "SY6", Morse, fishing buoy beacon, readable, fading, -118 dBm. Note on SY6 timing cycle: 3 Morse IDs repeated with a 1.5 second long DF dash, then beacon is OFF for approximately 4 minutes 50 seconds. 2097.28 kHz CW, "A", Morse, beacon, land, good readable, -100 dBm. The ionogram below shows the Pt. Arguello Digisonde data at the time of this log report, with foF2=2.175MHz, fxI=2.90MHz. Thanks for the 2 MHz report! I've listed to the fishing beacons in the past as well (you can likely find some threads here on the HFU, not sure which board). They used to infest the 160m band as well, but I don't see as many there. whip antenna mount on top center. Yes, we are copying the remnants of old legacy cw buoy beacons with their old lead acid battery packs; probably just the ones that haven't been lost in the ocean yet or traded in for shiny new solar GPS buoys. Thanks for your previous fishing beacon postings, they are especially valuable as a reference. As you've indicated about the Atlantic, those legacy buoy beacons are also scarce now on the 160m band in the Pacific within range of west coast USA. Perhaps the older beacons are still being utilized in the Pacific and Indian Ocean near southeast Asian and Oceania waters. 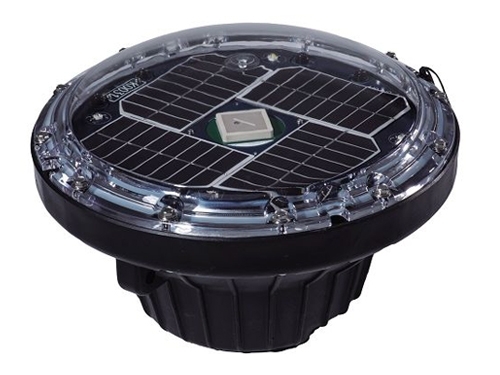 For the investment in time and equipment, it is no wonder that the newer GPS beacons are replacing the old battery hog buoys that were sitting ducks for poachers. That S.Korean Sajo Oryang tuna fleet probably operates a lot of buoy beacons. Ever wonder how many of those old buoys were lost and ended up floating around in the Pacific Garbage Patch or Atlantic? Has anyone tried to use KiwiSDR TDoA to locate a fishing beacon? You'd probably have to wait patiently and start the TDoA process just as the beacon begins its series of transmissions, to have a chance. Regarding the 2 MHz Western USA beacons... A coming in well on 2097 as usual. For fun I am trying for the 2008.4 beacon, no luck, as expected. I did hear a fishing beacon on 2021, missed the call. I see evidence of some in the 160m band. On a good night, it would probably be possible to kiwi-TDOA some of the stronger and longer duration fishing bouy signals; with the IQ bandwidth set to about 100 Hz, if one can find a few stations with the right geometry and good SNR. So many stations in the kiwiSDR network are using small whips or loops that are close to RFI sources, that it is sometimes difficult to find 3 sites that are suitable for DFing the weak signals, especially in the MF and lower HF range. p.s. While checking for A on 2097 just now I noticed fishing beacon IU5 with a very strong signal on 2021 kHz. Maybe I will try TDoA on it. thanks for the great thread with pictures and recordings. I was lucky back in Nov. 2016 to catch one driftnet beacon in the Pacific. It did not transmit continuously, was about 4 minutes between sets. Seemed to send the id BFL4 three times and there was long dash after that then off. Just adding my observation of that ‘A’ beacon on 2097.3 ish (handheld receiver here, hard to zero beat frequency exactly). It’s JBA here in Sedona, AZ on my Tecsun PL-880 at 0007 UTC. Sun is just setting. Maybe frequency is drifting a little too? Yes, the frequency drifts lower with cold temps and higher on hot days. For example, when desert temps are in the 80's it has read 2097370 Hz and tonight it reads 2097850 Hz (not super accurate readings) when temps are in the low 40's I have seen some large variations where I have wondered if in summertime there is direct sunlight on the transmitter box making it hotter than ambient air temps.. Highlight of this report: 2008.4 kHz UNID ditter beacon again and 8 fishing buoy beacons. 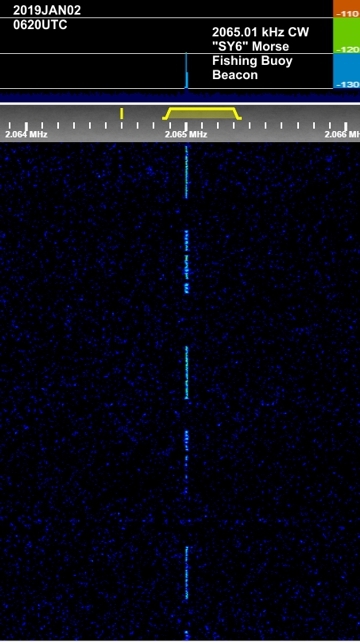 This peekaboo beacon was reported by Token many times between 2012 and 2018. It has changed its duty cycle slightly over the years from a dasher to a ditter, now with shorter CW dits rather than long dahs. 2008.40 kHz CW, UNID, ditter, beacon, land, 150 millisecond dit duration, 2.8 second repetition, ON for approximately 1 minute 40 seconds, OFF for approximately 3 minutes, weak readable, -110 dBm. 2097.28 kHz CW, "A", Morse, beacon, land, good readable, -92 dBm. 2129.01 kHz CW, "KV6", Morse with DF dahs, fishing buoy beacon, 8.4 seconds repetition, weak readable, fading, -112 dBm. Note: Background noise level 3 kHz bandwidth approximately -122 dBm. 2019JAN23 1545UTC, just after local sunrise. 2 MHz propagation to the mid-Pacific ocean is good here at this time. Various fishing buoy beacons were logged. Note: Background noise 3 kHz bandwidth approximately -125 dBm. Glad that the reports are appreciated. Your consistent beacon reports over the years are quite a tome of reference! Yes, the conditions on 2 MHz have been fairly good recently. The 2008.4 kHz ditter seems to be very consistent, but weak. The latest 2 MHz report has more details about its timing. The fishing buoy beacons are getting more rare in West Coast waters, so good luck catching a few of them while there are still some around. It's doubtful that many MF fishing buoys will be active for more than a few years more around here. We bear witness to their extinction.